Download the following resources or watch a video. 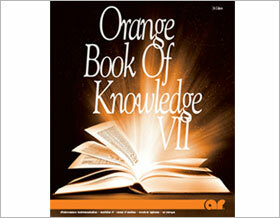 The AR Orange Book of Knowledge (obk), Volume VII is available. If you have VI, replace it with this edition! 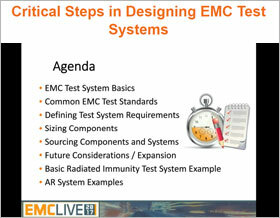 This edition offers 6 brand new application notes, EMC formulas and 7 revised all written by engineers. The OBK, for so many engineers, “go-to” source everything anything related to emc! AR approaches each system effort, large and small, with the same fundamental concepts to produce systems with the highest levels of; performance, quality, reliability, and efficiency. These systems give you the peace of mind that you are going to produce the field strengths you require with a margin for unforeseen circumstances that may arise due to chamber inconsistencies. This new EMC Systems guidebook now includes details about AR’s new low-cost RF Conducted Immunity System for military, medical, consumer electronics, automotive and aircraft markets. Also find details on the Award-Winning Field Generating Systems, the new AA Series. 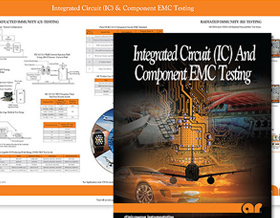 AR’s new poster on Integrated Circuits (IC) & Component EMC testing provides greater insight into the test equipment and setups used for IC testing. This easy-to-use reference allows you to maximize your test efforts. Download or request a hard copy of the new poster today. 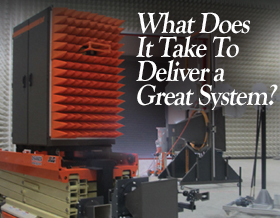 In this video, AR discusses the most critical aspects of designing an EMC test system to meet your specific needs and requirements. The focus is on selecting and sizing the appropriate equipment and learning the appropriate questions to ask in order to achieve these goals. AR has the experience to develop full-turnkey solutions for a multitude of requirements – not only Radiated Immunity but Conducted Immunity, Radiated Emissions, and Conducted Emissions as well.